Ever wonder what it takes to write a best-selling book…or two? Here's your chance to find out! 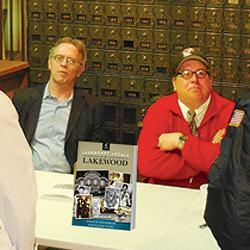 Authors Walter Neary and Steve Dunkelberger at a book signing earlier this year in the history museum. Tues, September 16th, 7 pm “The Making of the Lakewood Photo Histories and Where Do We Go From Here?”, St Mary’s Episcopal Church,10630 Gravelly Lake Dr SW, Lakewood. Spend a lovely September evening with us, taking in what's sure to be a particularly fun and fascinating Monthly Program. Can anyone think of a better way to bid farewell to a Summer so gorgeous it ought to go down in history? Presenting the program will be Steve Dunkelberger and Walter Neary, a mega-talented writing team who together must see more history going down in a month than the rest of us see in a lifetime. If you doubt it, just pick up one or both of their two fact-packed, best-selling books on our fair city's lively past. Their latest, released just this year, is Legendary Locals of Lakewood, an amusing and highly informative compendium of stories and photos bringing us up close and personal with a truly remarkable crew of--you guessed it--legendary Lakewood locals. From Iva Alice Mann to Edgar Eisenhower to Ivan the Gorilla to…well, we could go on for hours. You'll certainly want to, once you crack the covers. Legendary Locals was preceded by Images of America: Lakewood, Steve and Walter's addition to the well-known series of photo books that look back lovingly at the various towns, cities and regions of our nation as they were in times long past. Each volume is an unforgettable excursion into a world of vanished Americana, and Steve and Walter's contribution is no exception. So come hear these experts relate the nitty-gritty back-story of putting a best-selling history book together--you might wind up taking a shot at it yourself. Even if you don't, you'll want to curl up with one of Steve and Walter's books--easily accomplished, since they'll be on sale before and after the presentation! As usual, the program's FREE--and so are the refreshments. See you there!